The fin whale is the second-largest living animal, after the blue whale. This animal is very streamlined in appearance with a distinct ridge along the back behind the dorsal fin, which gives it the nickname "razorback". The dorsal fin, which is about 60 cm high, is set two thirds of the way along the back. The jaw is large and when the mouth is closed the lower jaw protrudes slightly beyond the tip of the snout. Fin whales are slimmer and not as heavy as blue whales. On average, 85 ventral grooves run along the underside of their body and there are 350-400 baleen plates in their mouths. Fin whales are found in all the oceans of the world, but their migration patterns are not well understood. In the Southern Hemisphere, fin whales migrate south to feed on krill and other plankton in the summer, and north to likely give birth in warm waters closer to the Equator in the winter. However, it is not clear whether all of the population engages in this migration every year. In the Northern Hemisphere there are similar north-south migrations, and many whales appear to return to the same feeding grounds every year, but the pattern is not so clear, perhaps because of the influence of the Gulf Stream in the North Atlantic. Populations of northern and southern hemispheres never meet. Adult fin whales are about 19 m long for males and 20 m for females, with a maximum of 25 m in males and 27 m in females. It is estimated that a 25-metre whale would weigh about 70,000 kg. Fin whales are dark grey to brownish black, with pale or white undersides. The undersides of the flippers and flukes are also white. Some fin whales have a pale grey chevron on each side behind the head and there may be a dark stripe running up and back from the eye, and a light stripe arching down to where the flipper joins the body. This species has a rare characteristic among mammals, known as asymmetrical pigmentation: the lower right jaw is bright white, the lower left jaw black. The reason for this unusual coloring is unknown, but some scientists have speculated that fin whales circle schools of fish with the white side facing the prey and frightening them into denser schools that are easier for the whale to catch. Fin whales are pelagic and coastal species, sometimes occurring in shallow waters (30 m). Although the species is mostly observed as single animals, fin whales are also sometimes seen in pairs, or in groups (or pods) that commonly count 6 to 7 individuals. However, up to 50, and occasionally as many as 300, travel together on migrations. Social structure seems to vary by area, and may be related to differences in age or feeding strategies. Young fin whales nurse for 6-7 months. Having reached approximately 12 m in size, they follow the female to the high latitude feeding areas. Sexual maturity is reached between 6 to 11 years. The life span of a fin whale is around 85 to 90 years. 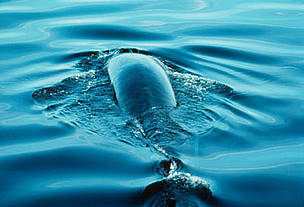 It has been assumed that mating occurs when the whales are in warm waters, but no breeding grounds have been observed. Females give birth every 2-3 years and the gestation period is 11 to 11.5 months. Usually a single offspring is born, reaching 650 cm long and weighing almost 2 tons. During autumn and winter, there is almost no feeding, at which time whales are found in lower latitudes. The diet varies between areas and seasons. 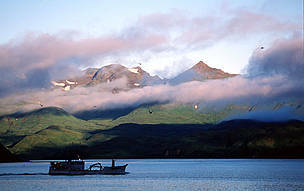 Herring, capelin and other shoaling fish are eaten in both the North Atlantic and North Pacific, along with squid, and euphausiids (krill - shrimp-like crustaceans) and copepods which are small crustaceans. The fin whale, like other baleen whales, strains its food from the water through baleen plates. Prior to the invention of the steam engine, whalers were unable to match the amazing speed of the fin whale, and they were largely saved from commercial whaling. That all changed in the early 20th Century, and the global fin whale population was quickly reduced by commercial whaling. Almost 750,000 fin whales were reportedly killed in the Southern Hemisphere between 1904 and 1979 - almost half of these in a single decade in the 1950s. 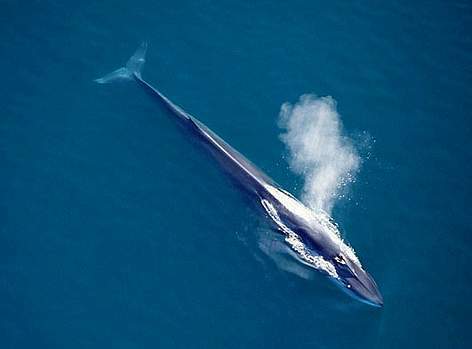 The fin whale has a global distribution, occurring in the north Pacific, north Atlantic, Indian and Arctic Oceans, as well as in the Mediterranean. In the North Pacific, fin whales are found in the Bering and Chukchi Seas, and along the coast of Alaska while in the North Atlantic, they can be seen around Canada, Greenland, Iceland, northern Norway, Spitsbergen and the Barents Sea. They are relatively rare in tropical or iced polar seas. In areas of the southern hemisphere where the species was once hunted intensively, they are rarely encountered today. The total population in the North Atlantic probably exceeds 46,000. Antarctic Peninsula and Weddell Sea, Bering-Beaufort-Chukchi Seas, Barents-Kara Seas, Mediterranean Sea, Northeast Atlantic Shelf Marine, Grand Banks, Chesapeake Bay, Yellow Sea, Okhotsk Sea, Patagonian Southwest Atlantic, Southern Australian Marine, New Zealand Marine, California Current, Benguela Current, Humboldt Current, Agulhas Current, Western Australia Marine, Panama Bight, Gulf of California, Galapagos Marine, Canary Current, Nansei Shoto, Sulu-Sulawesi Seas, Bismarck-Solomon Seas, Banda-Flores Sea, New Caledonia Barrier Reef, Great Barrier Reef, Lord Howe-Norfolk Islands Marine, Palau Marine, Andaman Sea, Tahitian Marine, Hawaiian Marine, Rapa Nui, Fiji Barrier Reef, Maldives, Chagos, Lakshadweep Atolls, Red Sea, Arabian Sea, East African Marine, West Madagascar Marine, Mesoamerican Caribbean Reef, Greater Antillean Marine, Southern Caribbean Sea, Northeast Brazil Shelf Marine. What are the threats to the fin whale? With krill reduced, will they go too? Fin whales have been greatly affected by historical hunting, mostly due to their economically valuable blubber, oil and baleen. The recovery of the southern hemisphere fin whale may be undermined by, among other things, a reduction of Southern Ocean krill due to climate change. Fin whales are also threatened by habitat degradation. In some regions they have been shown to carry high levels of pollutants such as heavy metals, PCBs and other organochlorine compounds that accumulate with age and transfer between mother and calf during nursing. These substances can cause health and reproductive problems in cetaceans. Boat collisions are another serious cause of fin whale mortality, particularly in areas with high-speed vessel traffic. A dead fin whale that was washed ashore in south-west England in early 2010 is believed to have been the victim of a ship strike. They are also vulnerable to incidental catches in fishing gear, but less so than many other cetacean species. Whaling remains a threat for this species. In 2006 Iceland resumed commercial whaling and in 2009 set a quota for 150 fin whales over 5 years – to date 125 fin whales have been harvested – despite the species' status as "Endangered". 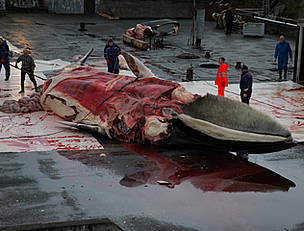 A fin whale is butchered by Icelandic whalers in December 2006 after the Icelandic government allowed the resumption of commercial whaling. Together we can make the world's oceans safe for whales. Learn more about WWF's work to protect whales. The fin whale can sustain a speed of around 37 km/hr, and can leap completely out of the water.